In this article we are looking into one of the factory method of Executors called newCachedThreadPool. This is useful when you want to create a thread pool that allows us to add as many worker threads as needed, but should reuse a previously constructed thread if available. This internally creates ThreadPoolExecutor object passing the required attributes that tweak the behaviour based on our need. The attributes are the corePoolSize which is set to 0, maxPoolSize set to the maximum integer value, worker’s thread alive time set to one minute and SynchronousQueue instance passed as task queue. The core pool size is 0 which means there is no limit on the number of worker threads. The new worker added will run the first task assigned, and then will poll the queue for any new task to show up before terminating. If there is no new task, after a minute, the work thread will stop polling and terminate. 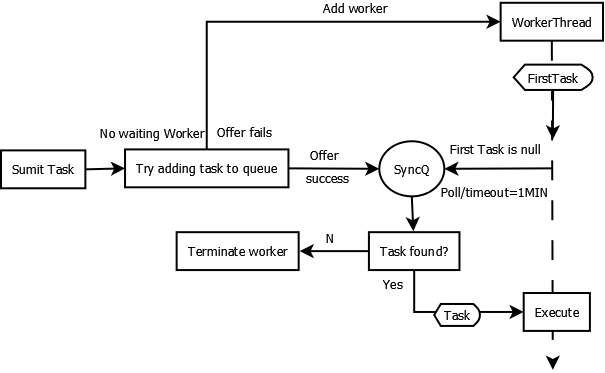 Thus whenever we submit a new task it will first try to use an existing worker if available else a new worker is created. Below is a rough flow diagram. When we submit the tasks second time, some of the tasks are run by the existing workers. We than sleep for few seconds and the submit the third time. You can see below, the third time execution results in creation of new worker threads. This was about creating new thread cache pool using Executors factory method newCachedThreadPool().